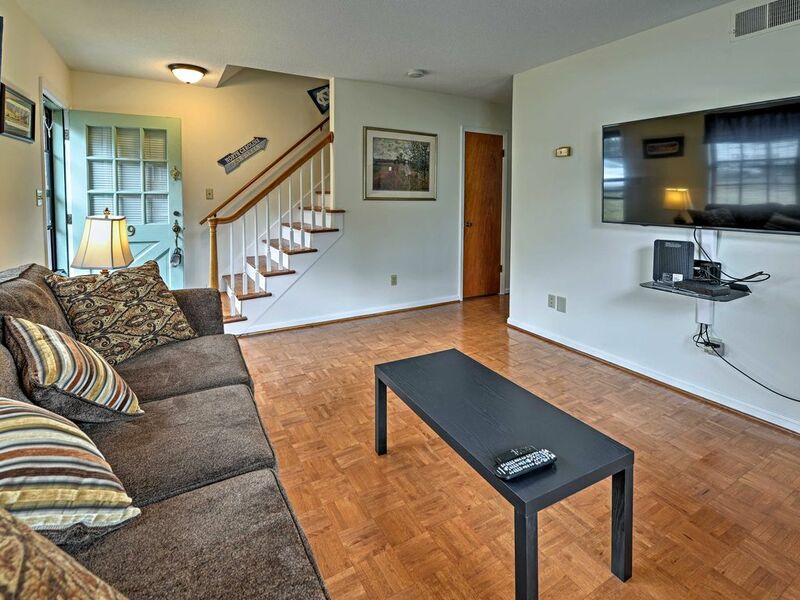 Pack your white and blue apparel and head to this vacation rental townhouse, located in Willow Terrace Condominiums, only 5 minutes from UNC’s campus. Boasting 1,000 square feet of living space that encompasses 2 bedrooms and 1.5 bathrooms, this home is perfect for a group of 4 individuals. The unit is nestled at the end of a row of homes, providing more privacy and a patio just off the back door, and right across the street from a mall with a grocery store, movie theater, Starbucks and more! Willow Terrace greets you with tall, aging trees and welcoming, brick homes. Pull up into the designated off-street parking spot before unloading your belongings. Parquet hardwood floors meet your feet as you step through the front door into the spacious living room. A couch, which doubles as a sleeper sofa, faces a flat-screen cable TV. If you can’t make it to the college stadium, root on the Tar Heels from the comfort of your own home. Just off the living room is the fully equipped kitchen, which houses everything you’ll need to prepare home-cooked meals. Enjoy your savory creations at the kitchen table with seating for 4 or walk over to the community pergola, where you’ll find outdoor tables and picnic tables. When the day falls to night, head upstairs to find both bedrooms. Each room features a queen-sized bed and a closet, while a full-sized bathroom sits between both bedrooms and offers a shower/tub combo. During the summer, spend your days lounging under the warm North Carolina sun next to the community pool. A convenient location makes this vacation rental even more desirable. As you walk through UNC's campus, which is only a 5 minute drive away, you'll be surrounded by some of the most magnificent architecture and landscaping in the state. If you prefer the Blue Devils over the Tar Heels, Duke is just 13 minutes away. After cheering on your favorite college team, spend time at some of Durham's other landmarks, like the Eno River State Park and Museum of Life and Science. When it's time to refuel and rehydrate, drink and eat your way down Franklin Street. Located just 3 minutes from the townhouse, Franklin Street is home to some of the best dining and nightlife in Chapel Hill. Just across the street is a mall, which houses a 24 hour grocery store, movie theater, Planet Fitness, Starbucks and more. Stay on track with your workout routine during your vacation or run across the street to pick up those minute ingredients. - Amenities include a fully equipped kitchen, 2 flat-screen cable TVs, free WiFi, private patio, washer and dryer, 1 designate parking spot, seasonal community pool, community picnic areas, and more! - Great Chapel Hill location - Easy access to UNC, Duke, Franklin Street, restaurants, shops, bars, grocery stores, fitness center, and more! This accommodation met our needs. The location is perfect . The accommodation met our needs. The front door lock was difficult to maneuver . Checking in /out was simple. We would recommend freshening up of inside kitchen cabinets . Needs a thorough cleaning and some basic utensil additions would be helpful. Good location with shopping and restaurants close by. Beds were very comfortable. However, other furnishings and kitchen supplies were minimal. The shower leaked badly into the laundry area below and there was not enough hot water if more than one person needed to shower. If you just need a place to sleep, this is fine. Very comfortable and cozy. Just what we needed to relax for the holiday. The house had all the amenities of home. Conveniently located in the heart of Chapel Hil!! Spacious, clean and well equipped.